Utranazz Hydromix SRY350G self loading concrete mixer truck is designed to work as a ready-mix concrete delivery vehicle and is suited to work in all types of areas, from busy city centres to remote villages. With a 3.5m3 wet concrete output it can handle all types of concrete deliveries, from large pour volume jobs to small deliveries for the DIY markets. A self loading concrete mixer truck can even work on-the-job as an on-site batching unit. The SRY350G self loading concrete mixer truck is fitted with electronic weighbatching equipment which shows the exact weight of raw materials going into the drum and the exact amount of concrete that is discharged. This allows the operator to split loads of any quantity and enables multiple deliveries. A further advantage is that it can re-load with raw materials from any builders merchants or satellite depot, as it has its own batching equipment, self-loading equipment, on-board water system and auxiliary engine. 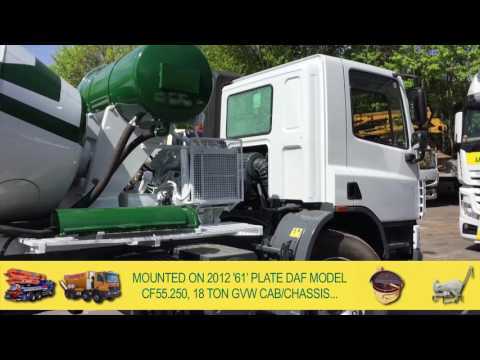 The SRY350G self loading concrete mixer truck can be fitted to any cab/chassis, with the correct specifications, or even onto a trailer.